​DO YOU KNOW: That Jesus promised His disciples that He would return to earth personally and receive them to Himself, so that where He is (in heaven) they would be also (John 14:3; 17:24)? ► That God did not plan to convert the world before Jesus' Second Coming, but rather "to take out of them [from every kindred, nation, etc.—Rev. 5:9, 10] a people for his name" (Acts 15:14), to reign over earth with Him in His 1,000-year Kingdom, for the blessing, judging and conversion of the world (Acts 17:31; Rev. 3:21; 20:4, 6; Matt. 19:28; 1 Cor. 6:2)? ► That when Jesus in His Second Advent takes to Himself His great power and begins to reign, the nations are "angry," far from converted—"When the Son of man cometh, shall he find the [so the Greek] faith [the true Gospel] on the earth" (Luke 18:8; 1 Tim. 4:1; 2 Tim. 3:1-8, 13; 2 Pet. 3:3, 4; Psa. 2:1-12; Rev. 2:26, 27; 11:17-19; 19:11-21)? ► That at Jesus' First Advent He laid down His perfect human life as a Ransom (a corresponding price) for Adam and the race in his loins (Matt. 20:28; Mark 10:45; Rom. 5:12-21; 1 Tim. 2:5, 6; Hos. 13:14) and opened for the Church a new and living way, to immortal life, the Divine nature (John 14:1-6; 2 Tim. 1:10; Heb. 3:1; 10:19, 20; 2 Pet. 1:4)? ► That in Jesus' Second Advent, a 1,000-year period, He first exalts the Elect Church, His Bride (1 Cor. 15:50-54; 1 Thes. 4:15-17; 2 Tim. 4:8), and the Great Company, "the virgins her companions" (Psa. 45:14, 15; Rev. 7:9-17), and the rest of the elect (Psa. 45:16; Isa. 32:1; Luke 13:28), and then blesses all the rest ("the residue") of mankind, the non-elect (including awakening the dead—John 5:28-29, ASV; Dan. 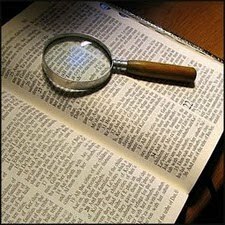 12:2), in "the times of restitution [restoration, ASV] of all things, which God hath spoken by the mouth of all his holy prophets since the world began" (Acts 3:19-24; 15:16, 17; Isa. 35:1-10)? DO YOU KNOW: That Christ's joint-heirs, the Church, will as a part of Abraham's Seed assist Him in the incoming "times of restitution" in blessing "all the families of the earth," giving to "whosoever will" the "water of life freely" (Rom. 8:17; Gen. 12:3; 22:18; Acts 3:25; Gal. 3:8, 16, 29; Rev. 22:17)? ► That while God grants no second chance to any of Adam's race, He gives one full, complete opportunity for everlasting life to all—if not in this life, then in the Restitution times—for Jesus tasted death "for every man" and the "good tidings of great joy shall be to all people" (Heb. 2:9; Luke 2:10, 32; 3:6; John 1:9, 29; 12:32; 1 Tim. 4:10; 1 John 2:2)? ► That Christ "must reign [in His 1,000-year Reign], till he hath put all enemies under his feet. The last enemy that shall be destroyed is [Adamic] death" (1 Cor. 15:24-26; Rev. 21:4)? ► That Jesus was "put to death in the flesh" for the life of the world (John 6:51), but was raised, born from the dead (1 Cor. 15:20; Col. 1:18), not as a human being, but as a spirit being (1 Pet. 3:18, ASV; 1 Cor. 15:45, 50; 2 Cor. 3:17; 5:16), far higher than the angels (Eph. 1:20-22; Phil. 2:8-11), in the exact image of God's person (Heb. 1:3-5), invisible to human eyes ("whom no man hath seen, nor can see"—1 Tim. 6:16; 1:17; John 1:18; 5:37), and able to come and go like the wind (John 3:6, 8)? ► That while spirit beings in their normal condition are invisible to human eyes, they have been permitted to materialize in human bodies, and then later dematerialize, e.g., the angels that appeared to Abraham, Gideon, etc. (Gen. 18:2; Judg. 6:12, 21)? ► That similarly Jesus as a spirit being appeared to His disciples after His resurrection in various fleshly bodies, or forms (Mark 16:12), with clothing created to suit (the soldiers had taken His clothing—Matt. 27:35): e.g., as a gardener (John 20:11-18); as a traveling stranger (the Emmaus disciples knew Him only after He broke bread with them, after which He dematerialized and vanished—Luke 24:13-35); as one with nail-prints in hands and feet (John 20:25-29); as one seeking fish, etc. (John 21:1-14; Matt. 28:16, 17)? DO YOU KNOW: That only as a spirit being could Jesus have entered His disciples' assembly room with its doors closed for fear of the Jews, when He materialized in a fleshly body, ate material food (as He had done in Abraham's day—Gen. 18:8), had them feel the body, and told them, "a spirit [which since His resurrection He is—2 Cor. 3:17] hath not flesh and bones [like He had created then and there in order to appear to them], as ye see me have [obviously flesh, bones, clothing, etc., could not have come through walls or doors of the closed room, though a spirit being, not having such hindrances, could do so—John 3:8]"—thus proving before He dematerialized that He really was present (John 20:19-23; Luke 24:36-48)? ► That Jesus did not materialize a fleshly body when He appeared to Saul, and the glory light from His spirit body (Phil. 3:21) struck Saul blind, a miracle being needed later to restore partially his sight (Acts 9:1-18; 2 Cor. 12:7; Gal. 4:13-15)? ► That the first stage of Jesus' Second Advent, His parousia (presence), is secret ("as a thief in the night"—Rev. 16:15; Luke 21:34-36; 2 Pet. 3:10), in which the world is unaware of it (Luke 17:26-30; Matt. 24:37-39; the Greek word parousia, meaning presence—see ASV margin—is here mistranslated coming), but in which God's true people know of it through Bible chronology and prophecy (many fulfillments) and signs of the times (1 Thes. 5:1-5)? ► That thus He comes "in like manner" as He departed at His ascension (Acts 1:11), i.e., quietly, without any great demonstration, unknown to the world, but known only to His true disciples (note that this verse does not state that He would come in like form or like body, but only in like manner)? ► That Jesus said before His crucifixion, "Yet a little while, and the world seeth me no more" (John 14:19), and therefore they will never again see Him with their physical eyes, though in the second stage of His Second Advent, His epiphaneia (manifestation), or apokalupsis (uncovering), they will with mental perception see Him "coming in a cloud [the severe trouble of the Great Tribulation] with power and great glory" (Luke 21:27; Matt. 24:21, 30)? DO YOU KNOW: That as Jesus is revealed to the world in His Second Advent, eventually "every eye shall see him [discern Him mentally, recognize His presence, power and authority in the destruction of Satan's empire and the establishment of His Kingdom on earth]" (2 Thes. 1:7, 8; Rev. 1:7)? ► That Bible prophecy, chronology and the signs of the times show that we are now in "the time of the end" with its great increase of knowledge and travel, and its unprecedented time of trouble (Dan. 12:1, 4, 9, 10; Luke 21:25-27; James 5:1-8)? ► That "in the days of these kings," present earthly governments represented in the toes of Daniel's great image, God is destroying Satan's empire and establishing His righteous rule on earth (Dan. 2:35, 44; Psa. 46:1-11; Zeph. 1:15-18; 3:8, 9; 2 Pet. 3:7-13)? ► That the "gospel of the kingdom has been preached in all the world for a witness [though not converting them]," so the Age's end is here (Matt. 24:14; 13:39)? ► That one of the many signs pointing to Jesus' Second Advent and His Reign of peace is Israel's return to their land, preparatory to their acceptance of their Messiah and great blessings on them and the Gentiles (Zech 8:1-23; 12:9, 10; 14:16-21; Matt. 23:39; Isa. 2:2-4; Jer. 23:5-8; 24:6, 7; 30:7-11, 18-24; 31:8-12, 27-34; Amos 9:11-15; Rom. 11:25-29)?